Some people naturally find themselves blowing smaller things out of proportion, while others try to tone the situation down as best they can. We all have moments where they dramatize or exacerbate a situation, but some do this much more than others. 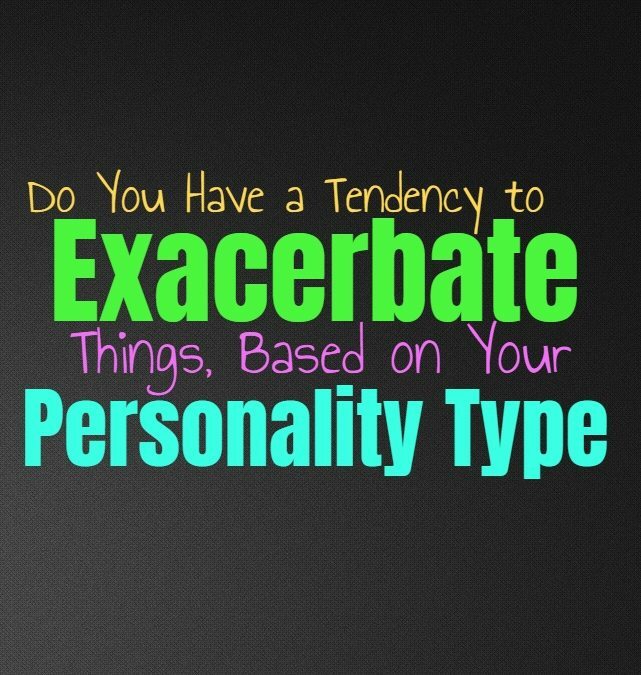 Here is how often you tend to exacerbate things, based on your personality type. INFJs try to avoid blowing things out of proportion, especially when they know it won’t serve them well at all. They do however, have certain times when they are feeling overwhelmed by emotions and so they tend to exacerbate situations when this occurs. When the INFJ is truly unhappy about something, they will often exacerbate these feelings and the negativity in their lives. Even the smallest thing that goes wrong becomes a bit deal and they find themselves feeling more short tempered and dramatic about these situations. ENFJs do sometimes exacerbate situations, especially when they are feeling stressed or overwhelmed. When they are struggling with something or feeling drained then they have a tendency to blow certain details out of proportion. The ENFJ might take the smallest of details and exacerbate it, feelings like it is actually a rather big deal. They find themselves overthinking in these situations and struggle to really find the right perspective. This is something which happens when they are under stress, and isn’t how they behave otherwise. INFPs can sometimes exacerbate things, since they don’t like being dull or boring. INFPs would rather analyze the situation and really feel it completely, instead of just brushing past everything. They also have strong inner emotions, and they don’t like neglecting these feelings for the sake of making other people look at them a certain way. When the INFP is connected to a situation or person, it can certainly cause them to exacerbate or dramatize things, without really meaning to do this. ENFPs can definitely exacerbate things, especially when they are passionate or feeling worked up. They have strong inner emotions and so sometimes this causes them to react in a way which might seem a bit overboard to others. The ENFP isn’t necessarily trying to be dramatic or exacerbate the situation, they are simply following what feels right to them. They don’t find it easy to pretend or hide from others, especially when there is something they are really connected to in that situation. INTJs don’t like to exacerbate or dramatic things, instead they want to use logic in order to figure out the truth. For them it is vital to take a step back and leave their emotions out of the equation. INTJs don’t like exacerbating any situation, instead they believe in being realistic and accurate to whatever it actually going on. For INTJs logic and factual information is what matters most, and so they aren’t likely to dramatic when it could cost them the truth. Instead INTJs want to be as practical and realistic as they can about things, not allowing themselves to exacerbate the details. ENTJs don’t like exacerbating the situation, instead they want to focus on the facts. They try their best to focus on the truth and don’t want to allow emotions to get in the way. ENTJs value efficiency and in order to be truly efficient they can’t exacerbate or dramatic something when they should be remaining calm about what is really happening. For the ENTJ most things won’t become exacerbated, unless they are dealing with an emotion situation with someone they love. In these cases they can sometimes struggle to really process emotions properly. INTPs don’t like to dramatic or exacerbate when they much prefer to be logical and calm about things. They do have times when their thoughts can take over and cause them to overanalyze and exacerbate though. When the INTP overthinks a situation they can sometimes exacerbate certain details and potential outcomes. Their minds can consider all of the ways the situation could go wrong and this can cause them to exacerbate without realizing what is really happening. ENTPs do sometimes exacerbate things, but on certain occasions this is purely for the fun of it. They enjoy seeing where things might go and want to look at the situation from many different angles. Sometimes ENTPs will dramatic in order to gain from the experience and really figure out where the happy medium will be. They also overthink sometimes, analyzing the situation and recognizing where things will likely go wrong down the line. This can cause them to exacerbate things, since they can see the different potential outcomes. ISTJs don’t often exacerbate things, quite the opposite actually. They focus on remaining calm and don’t want to allow emotions to ever get in their way. They believe in working hard to get the job done, and don’t believe in exacerbating a situation when they should be practical about it. They want to be as logical and precise as possible so that they can be sure they are getting things done efficiently. For the ISTJ it isn’t smart to exacerbate, since this leaves them unaware of the appropriate reaction to the situation. ESTJs don’t like exacerbating a situation when they should be focused on getting things done. They believe in being efficient and always trying to remain focused on the facts of a situation. ESTJs realize that if they want to get things done the right way, they need to take a step back and not allow their emotions to stand in the way. They don’t want to exacerbate when what they should be doing it analyzing and looking at the facts. ISFJs do sometimes exacerbate things, especially when they are emotionally invested in the situation. They don’t intend to react this way but sometimes they can become stressed or worked up. When the ISFJ is under a lot of stress they sometimes have a hard time looking at things without exacerbating the situations they are worried about. When a small thing goes wrong they can become upset about it, simply because they are already under stress. ESFJs do sometimes exacerbate situations, but this happens when they are under a lot of stress. When they are feeling stressed and overwhelmed they find it difficult to really look at the situation without feeling like it is a bit worse than it actually is. ESFJs don’t like doing this, since they prefer to focus on getting things done and want to be efficient. When they are feeling overwhelmed they find themselves exacerbating the smaller things, worrying that everything will go wrong. ISTPs don’t like exacerbating a situation, especially in an emotional manner. They prefer to focus on facts and don’t want to become dramatic and worked up when there is no need. They do however like ramping things up and making it a bit more dramatic when they are feeling bored and really need to experience something with excitement. ESTPs do sometimes exacerbate situations, especially when they are upset or emotional. They can sometimes become a bit dramatic about something, even when they realize they shouldn’t be. ESTPs are simply very passionate people and sometimes this causes them to exacerbate something, especially if they are excited about it or very emotionally connected to whatever is going on. ISFPs do sometimes exacerbate things, mostly because they are emotional people who follow their hearts. They go with whatever feels right in the moment and sometimes this causes them to blow things a bit out of proportion. They don’t do this intentionally, but they feel it is important to follow their hearts and do whatever inspires them most at the time. This can lead the ISFP to exacerbate certain things, especially when they are emotionally invested in them. ESFPs do exacerbate things sometimes, since they can be emotionally driven and dramatic people. They follow their hearts and enjoy living in the present moment, instead of feeling held back by overthinking. ESFPs do exacerbate situations because they become so connected to what is happening and they don’t like feeling like they have to refraid or hold back. They express themselves outwardly and enjoy being present, they also find themselves wanting to shake things up from time to time.